King: Let’s move on to a guy on the ballot in 2008 as the vice presidential nominee, on the ballot in 2012. Some of us think Joe Biden, at least he’s exploring 2016 as well. Listen to him here speaking to a progressive organization in Washington. He says go back and remember 2008 was about hope and change. Well, here’s Joe Biden’s current version. 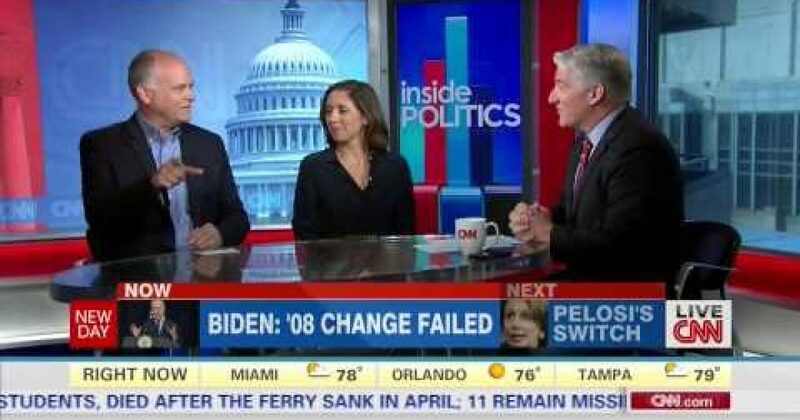 Biden clip: Look folks, this is within our power to change. Everybody says because we tried in ‘08 and it didn’t happen. King: You can read that, Ron Fournier, as persistence, we’ll keep trying or you can read it, yeah, well, all right, we failed. Fournier: There must be a clip after that where he says, hey, I’m just kidding. He — he basically conceded the original sin of the Obama presidency, which is, we promised to at least start changing Washington and we failed, and then later on what he does say there is we can change things if we’re the drivers of the change. Well, who’s been driving the last five and a half years? It was a really bad moment for the White House. King: You think a really bad moment. You cover the White House every day, they say this is the appeal of Joe Biden, he calls them like he sees it, he’s a straight shooter. They can’t like that. Pace: They like it when he’s straight shooter saying things that help they certainly don’t like it when he’s a straight shooter and saying that essentially the White House has failed in changing Washington. This is why it would be so difficult for Joe Biden to run for president because he would be running for president as an active part of this administration.